Winners/Marshalls are getting in the Imperial Speeder w/AT-DP Pilot for 12.99 along with Ezra Speeders and Assault Walkers which had appeared earlier. Saw Micro Machine Gold Series 3-packs at various Winners: Empire Defeat, Battle for Naboo, Clone Army Clash, Resistance Base and Starfighter Assualt - 3.99. 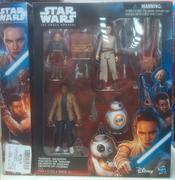 Also saw at a Marshalls the Hot Wheels Jedi Luke vs Rancor character car 2-pack which I don't recall seeing before. Winners is getting in the Galactic Heroes Ghost w/Ezra & Chopper - 19.99. Found the Takodana Encounter 4-pack at a Winners - 14.99. Takodana is bloody old - not the Rogue One version??? Either way, well worth the price. Nice find. I was very glad to have waited to start on my 5POA collection so purchasing t hat wasn't a bunch of duplicates for me. I love Maz! Found Hasbro FO Snowspeeders and Jakku Landspeeders at both a Winners and a Marshalls - 19.99. Honestly would have loved the Snowspeeder if it weren't designed for 5 POA figures. The steering wheel is so wide. Saw Rogue One Tie Striker for $24.99 and U-Wing for $32.99 at Winners. Also saw the Tie Striker and U-Wing as others have mentioned. Those were not on clearance, but they had a lot ... so maybe someday soon. My nephew found Rogue One Wave 3 2-packs at his local Winners - ST Commander/Baze and Phasma/Finn - $8. It's worth noting that the Baze figure from the wave 3 (Finn/Phasma) case has a different, less yellow skin tone from the original release. It looks a bit better. I have not found a Baze yet. I will check out winners today. I saw Sabine, Leia ANH and Snowtrooper 6" figures at a winners in my town today only $14.99 each! Sweet deal, I will grab another Snowtrooper if I see one at that price. Page created in 0.053 seconds with 43 queries.